From design to materials, our baskets are 100% American heritage baskets. Bases and lids are handturned from PA hardwoods and custom fitted for each handcrafted basket. 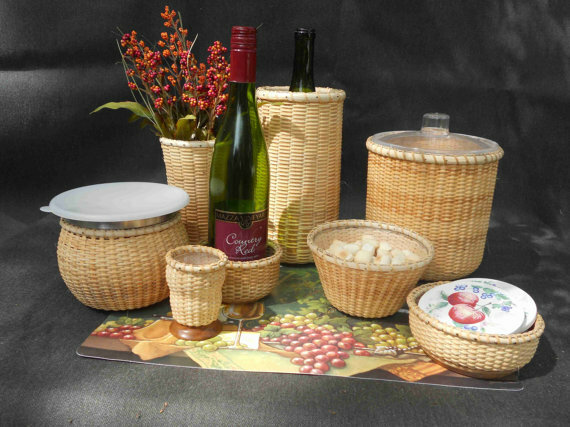 Basket is woven using rattan, cane, PA hardwoods, and Chipwood, making an elegant basket for personal use or as part of a decorative showcase of handcrafted PA baskets. Nantucket Lightship baskets are truly an American heritage basket. In the early 1800's, sailors tending the lightships around Nantucket Island, spent 6 months on board an anchored ship. During these times, they would weave the baskets using shipyard materials. Basket designs are drawn from research on Native American, Colonial, and Contemporary basket making.